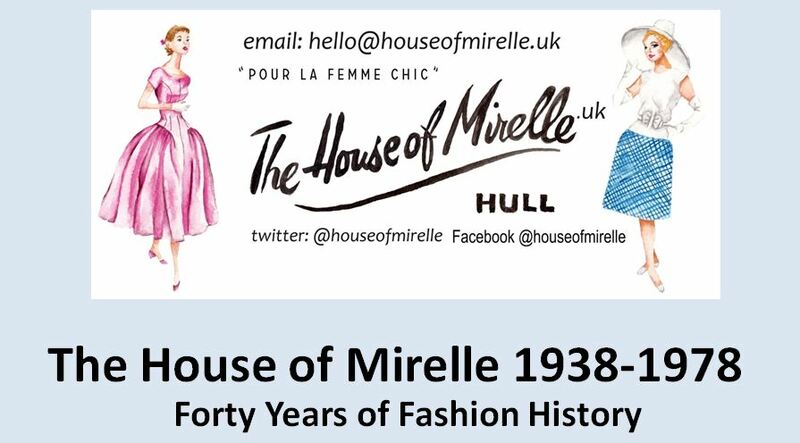 We are thrilled to be sharing the story of The House of Mirelle during the Tell The World season in the UK City of Culture. Totally, completely and utterly free for anyone to attend the talk is from 12:30 to 1:30 on Tuesday 14th November at Hull History Centre part of their lunchtime club. Come along and fill your lunch break with more than sandwiches! See what it was like shopping in the old days, what fashions were associated with The House of Mirelle and what the East Riding modelling industry was like – yes there was one! You’ll hear all about Boutique Couture and learn some of the sewing skills that were part of Mirelle too. The talk is illustrated with gorgeous photos that will make your mind pop with excitement and is a must for anyone who adores vintage fashion. It’s anticipated that the talk will be busy, seating is available for 100. The History Centre is a short walk from Albion Street and is situated behind the New Theatre. Some parking is available in Albion Street car park. The Centre is fully accessible and has a snack kiosk and toilets. The content is suitable for all ages and is designed with accessibility in mind. If you need space for a wheelchair or to sit in a place to help you see the slides or hear the narration please let the History Centre or The House of Mirelle team know in advance. If you require further information do contact the History Centre on 01482 317500. Next Post Hull Fashion History: What Was Great About 1978!